I graduated in Industrial Design specialising in Furniture and Related Product Design from Ravensbourne College of Design and Communication. My first job was working in Riyadh for the Saudi Arabian Royal Family. I worked on a new Palace which, on completion, featured in the Andrew Martin Yearbook in 1998. From there, I moved to Paris and worked for Atelier Pierre Bonnefille, before returning to the UK where I had stints with Jonathan Reed and John Minshaw. After this, I started working for myself as a furniture maker and designer, and founded my own brand of furniture in 2011. How did Stuart Scott come about? I had been designing furniture for quite a while and had worked with so many talented makers that I thought why not bring them all together and start producing? We exhibited our first collection at Decorex in 2011 and from that point on we have continued designing, developing and making furniture for some amazing clients globally. As a furniture maker and designer, I started the company, not thinking of selling only within the UK, but to the world as a whole. It’s a strategy that has stood us in good stead. I love the clarity and functionality of classic modernism, the exuberant, flowing lines of Art Deco and the inherent beauty of natural objects. As a furniture maker, nature delivers the most amazing structure and patterns. I find the design process of biomimicry fascinating! Do you design and manufacture in England? We design and make all of our pieces by hand, here in Wiltshire, England. 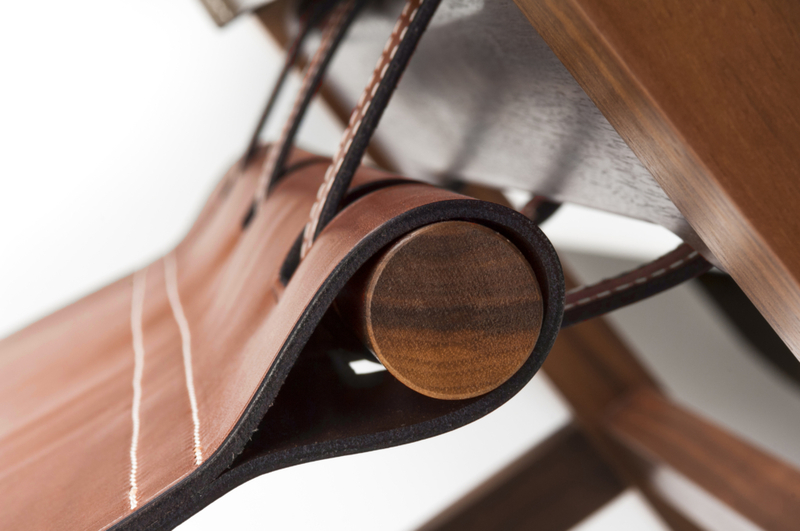 As a furniture maker, each piece is signed and individually numbered. It is of paramount importance that our pieces are made in England. We are proud to say that we are a home grown maker! As a nation, we have a lot to be proud of and should support our artisan makers as much as possible. We are always trying to reduce our carbon footprint so even our suppliers are chosen for their locality as well as their quality. 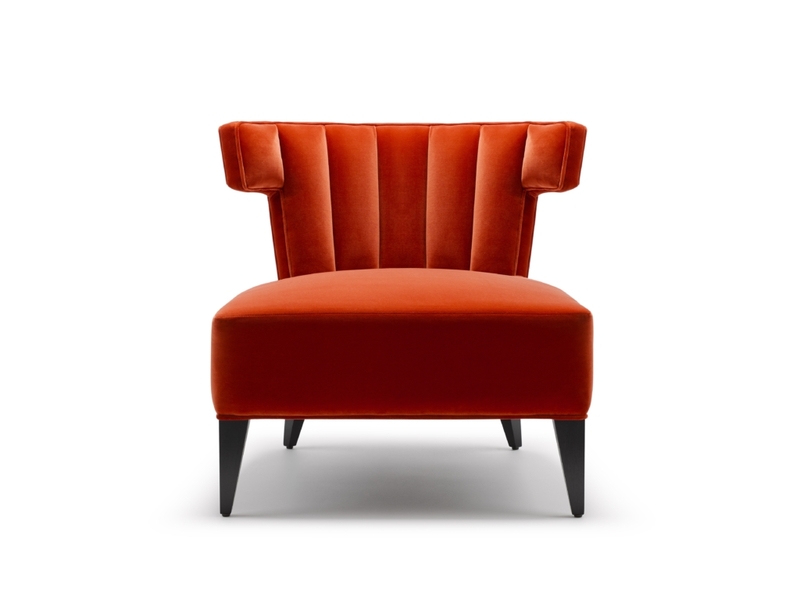 Why is velvet so popular in luxury furniture design? Apart from its gorgeous feel, velvet unlike most other fabric has the most amazing depth of colour and can really make your designs pop. Some of our best pieces have been shown in beautiful velvet, from our Kingfisher velvet Fleure Sofa to our Terracotta Red Isabella Slipper Chair. Once people see these, they don’t want us to upholster in anything else! The Fleure Sofa was designed in 2011 then became Winner of Best Sofa at the 2012 International product design awards in association with Design et al and the Design Society. I’d just designed a deep buttoned sofa (The Tux) and wanted to create something different that celebrated a fluted design. At the time, there was nothing really on the market with flutes. I’d seen old car bench seating with a similar style cue and thought it would be really effective if we turned this into a sofa design. The design is very simple, but the detail in the mitred corners and soft pillow-like flutes give the piece a tailored look; something that’s very on-trend at the moment. The individual fluted method gives the definition as opposed to a quilted method, which is something we didn’t want. 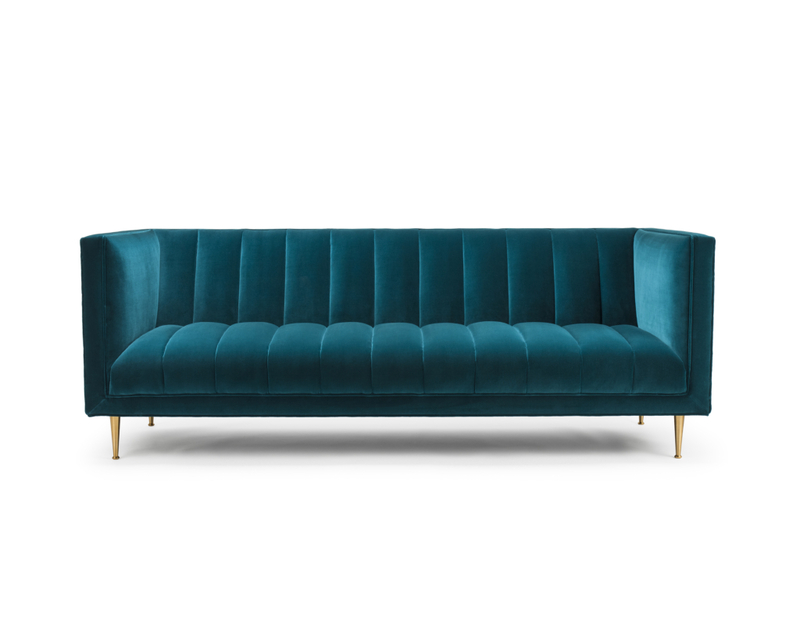 The sofa is challenging to make but, shown in velvet, looks pretty amazing! What are your favourite colours to work with? I love rich colours, such as kingfisher green and deep navy blue. As a furniture maker, the natural colours of machined brass and natural tan shoulder hide leather are also beautiful and authentic. Colours come and go with passing trends and these are quite subjective. I try to be bold with colour and want to create pieces that pop out! We made our Adoni sofa earlier this year and had it photographed in an amazing red wool. The colour was so beautiful under the studio lighting that it just looked spectacular! That is case in point. Our hardwoods are picked from our local mill. This way, we can cherry pick the best planks for their unique properties. Walnut for example is so expensive that you want to try and select the planks yourself as far as possible in order to reduce wastage. Our fabrics come from a variety of sources but we tend to champion UK companies and are wool supporters, as well as velvet. Abraham Moon & Sons for example have been producing wool in Yorkshire since the 1800’s. 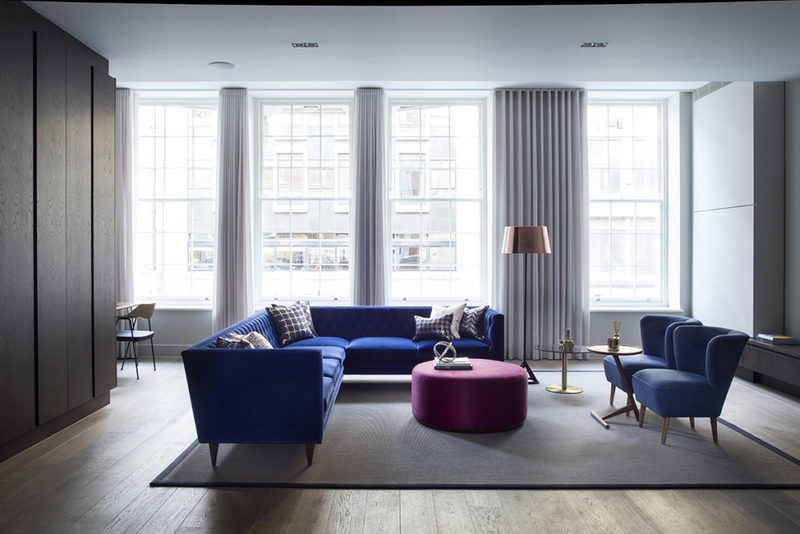 Wool is gorgeous to work with, is inherently fire retardant and upholsters beautifully. What are some of your favourite materials and textures to work with? I love brass, particularly when it patinas with age. I love leather as this too ages beautifully. Solid American Black Walnut is my absolute favourite timber. The light and dark tonal grain variations are incredible. We like to oil our timbers and this method warms the timber and makes it beautifully soft. Which is your favourite sofa in your collection and why? The Adoni Sofa upholstered in wool with legs in oiled walnut. It’s unashamedly modernist in aesthetic with the biscuit buttoned back, but the legs are quite unique and elevate the piece. It’s also very comfortable and the sofa I would have in my own house. What inspires you to create your occasional tables? The occasional tables are created to be playful and unique. They are my own labours of love and I still assemble all of them myself. With a mix of strong finishes, block colours and precision engineered solid brass elements, this gives them a unique aesthetic. They are little statement pieces and I love working on each and every one of them. It is hard to pick a favourite although the Hex and Nicole are probably our most popular. 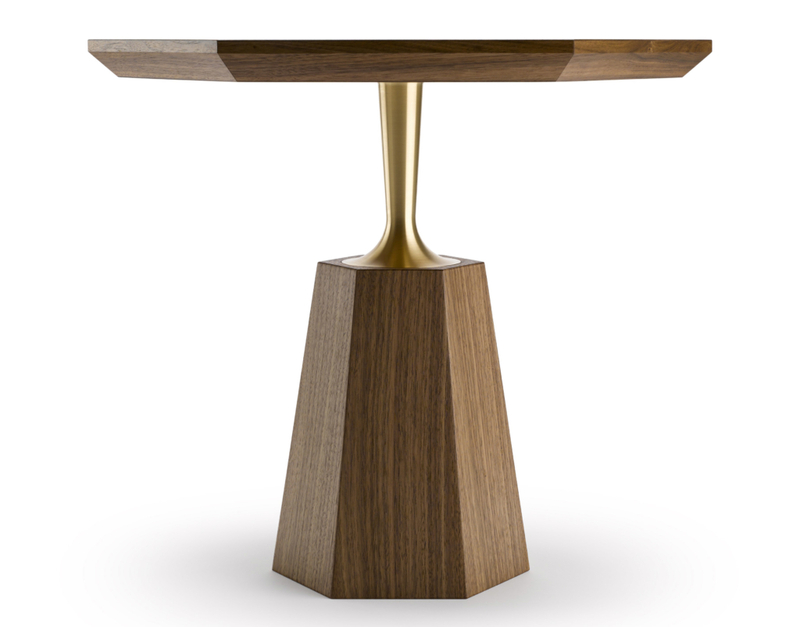 The Hex Table is available as a side, occasional or dining table. The hexagonal shape was chosen as it is prevalent in nature and interlocks effortlessly so that you can nest a group of tables together if you wish. I chose walnut and solid brass for this piece. You can have the walnut, natural or ebonised, and the brass, natural or bronzed. The brass neck is precision engineered and looks like it grows out of the base. This piece encapsulates what we’re about; attention to detail with natural materials, which will patina gradually. Which aspects of your job as a furniture maker do you enjoy most? When we prototype a new piece and the reaction in the studio is a unified YES! That is pretty cool. Taking something from a sketch and developing it into a product that we can use that also looks great is the best part of the job. Our client’s reaction and feedback is also very special. Delivering something that exceeds their expectations is what we aim to do. We’ve also been involved with some high profile collaborations and an example of this was when we created the bespoke upholstery for Sophia Webster’s first physical boutique in Mayfair. Studio Suss were the interior designers who brought us in. They’re great fun to work with! Who would you describe as a design legend? The film set designer Ken Adam was an inspiration of mine. His work on some of the early James Bond Films like Goldfinger and You Only Live Twice is inspiring and makes him a legend in my opinion. I would love to live in some of those set designs even now! Automotive Designers Frank Stephenson and Robert Melville who are both credited as designing the McLaren P1 have created Automotive perfection. The P1 is a perfect example of automotive engineering and sculptural ergonomics working in harmony. Do you have any top tips for an aspiring furniture maker and designer? You can achieve pretty much anything in life. You have to have resilience, perseverance and tenacity to succeed (and a little bit of good fortune!). It is very easy to give up especially early on in your career, but if design is what you want to do then you just have to make it work! You never know which doors will open for you, even if you have to give some a little push – they don’t always open for you! The one other bit of advice is to protect your intellectual property. It is crucial early on to seek advice regarding this as arguably this is the single most valuable asset you will have. What are your interiors trends predictions for 2019? 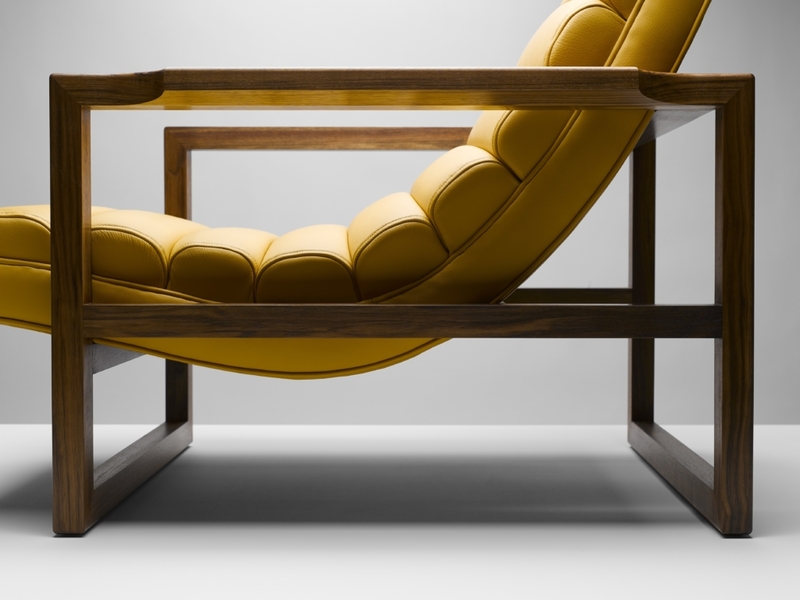 In terms of an approach, for the furniture maker there is a positive shift in ‘built to order’. I think people have become switched on to buying quality that is going to last them a while longer. Trend wise, I believe we will see more products celebrating past processes like weaving and steam bending, giving products a more authentic artisanal feel. We’ve already seen this commercially with the likes of designer maker Tom Raffield and his extraordinary steam bending. 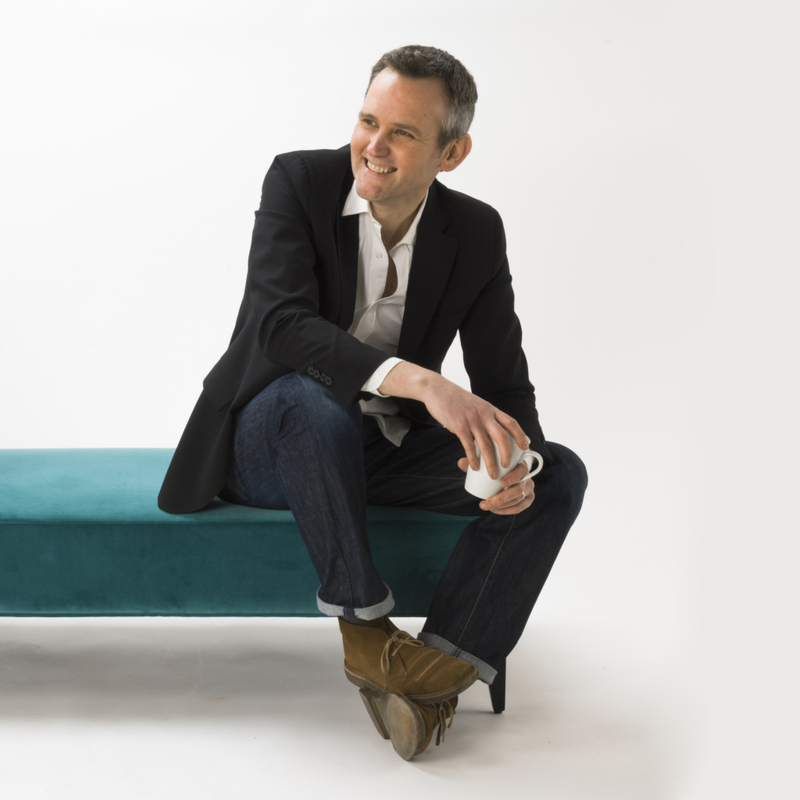 If you find furniture design just as exciting as we do, then you’ll just love our exclusive interview with bespoke furniture maker Zelouf & Bell.